Luther Mallory is a musician and a band coach living in Toronto. Raised in the Ottawa Valley in the small town of Arnprior, Ontario, he moved at the age of 19 to London, Ontario, to go to college – and find a band. After, like, 40 seconds of college, Luther gathered bandmates, started Crush Luther, and moved to Toronto, where the Canadian music scene was. In Crush Luther, Luther was the songwriter and singer, and the band was together from 2002 till 2010. They released two albums internationally, toured Canada five times, and performed on the east coast of the United States with a Warped Tour. They produced five music videos including two number 1 hits on Canada's music TV station, Much More Music. Somewhere in the middle of all of that, Luther managed stints as a music journalist, A&R director for an independent label, producer/co-writer, label owner, artist manager, and musical director/bass player. In 2011, Luther started an independent record label out of Toronto called Daycare Records (slogan: babysitting your stupid band) with Rolling Stone/Billboard journalist Karen Bliss. On the Daycare roster were battle rapper Kid Twist and indie/pop band The Danger Bees, both of which Luther produced and managed. The following year, former INXS frontman J.D. Fortune asked Luther if he would be interested in producing his solo record, which led Luther to a brief but intense nine months as the producer/co-writer/bass player for J.D. 's new band, Fortune (which folded due to blah blah blah). 2013! 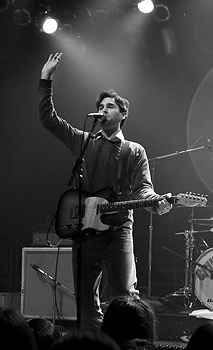 Luther began coaching bands on how to beat their fears of criticism, connect with their music and their bandmates on stage, and build their fan bases (visit Bandlimbo.com). Recently he started a new rock band out of Toronto called The Bow and the Blade, with his brother Devon and lifelong drummer P.J. Herrick. By the time this bio is printed, hopefully The Bow and the Blade will have won all of the Grammys and Junos for Best Everything. After so long trying so many things, says Luther, "This industry is like a mosquito lamp for me. It will probably kill me and I don't care. I can't stop myself. It's too intriguing."